When I read the press release about Bright Ones, which opens in 700 selected US cinemas on the 22nd April, I had severe doubts. Surely, I reasoned, a musical drama featuring young singers-turned-actors who'd previously recorded as Bethel Music Kids was either going to be horribly cheesy; a banal re-write of High School Musical with Christian conversion scenes shoe-horned in to attract a church going audience; or a thinly veiled promo for Redding, California's famed Bethel mega church. It was none of these things. In fact, I was absolutely staggered by the quality of what I WATCHED. 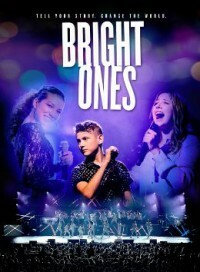 Bright Ones is a fine movie which deserves the widest possible audience. What film directors David Norona and Fred Vassallo have done is take a far from original plotline - students at a Californian school for the performing arts are auditioned and then asked to put together an all-singing, all-dancing musical show - and turn it into a life-affirming celebration of God-breathed creativity while conveying messages to young people which go way, way deeper than the shallow sloganeering of many evangelical films and which will right true to young people of no church-going background. What carries this film through is the unexpected acting ability of the cast and the undeniable quality of the music. Concerning the acting, the three main young singers-turned-actors, Josie Buchanan (playing Claudia), Peyton Allen (Jay) and Chloe Elizabeth Vassallo (Mia), are believable in their characterisations. Claudia, a singer who overcomes self-doubt and fear, and Jay, the fostered young man who's been turned down for adoption a few times and battles with his sense of belonging, are well acted while a tight script never descends into maudlin banality or tries to squeeze in too many God references. The effect is powerful and moving. There are also some well executed lighter moments from the would-be fashion designer who also shares a delight in updating old school church music and the two comedy hip-hop DJs and pranksters, played by Asher Hansow and Christian Allen, who raise a genuine smile or two. Pivotal to everything of course is the music and having such Bethel classics as "You Make Me Brave" and "No Longer Slaves", literally centre-stage, make for heart-stopping musical moments, particularly as both are sung with such soulful passion by Claudia and Jay. Also highly impressive, and at times downright catchy, are the new songs written by such major talents as Steffany Gretzinger and Amanda Cook. One pleasant surprise is hearing Brian and Jenn Johnson's "For The One" transformed from a pensive ballad into a piece of bubbling pop electronica. There is also a charming subplot when fashion-fixated Mia shows her appreciation of old church music and transforms the hymnal war horse "Take My Life And Let It Be" into a pop dance item, now called "Let My Life", and performed onstage by young and old. If ever there was a film to convince the church-going sceptic that you can find a connection with God through music without entering into an act of congregational worship, this is the one to do it. The CEO of Bethel Music, Joel Taylor, said, "We truly feel like this film is the fruit of our community's culture. To see the next generation rising up and leading while being confident in their gifts and identities in Christ is a powerful thing." I've been watching Christian-themed movies for many years and there have been a few highlights - Courageous and The Shack spring to mind - but I can honestly say that Bright Ones is the best Christian-themed movie I have ever watched. No doubt it will get a panning from the non-Christian liberal media and there will also be some conservative evangelicals critiquing it for its unashamed blending of pop entertainment and worship ministry. But I believe God loves it, and so will audiences young and not-so-young.